Effective VMware virtualization storage planning and management has become crucial–but it can be extremely complex. Now, the leading VMware expert on storage completely demystifies the "black box" of vSphere storage and provides illustrated, step-by-step procedures for performing every key task associated with it. You’ll gain the deep understanding you need to make better storage decisions, solve problems, and keep problems from occurring in the first place. 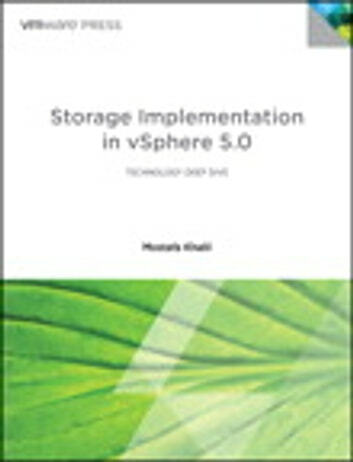 Mostafa Khalil presents techniques based on years of personal experience helping customers troubleshoot storage in their vSphere production environments. With more experience than anyone else in the field, he combines expert guidelines, insights for better architectural design, best practices for both planning and management, common configuration details, and deep dives into both vSphere and third-party storage. 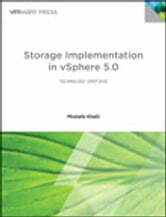 Storage Implementation in vSphere® 5.0 fully explains each storage connectivity choice and protocol supported by VMware, introduces Pluggable Storage Architecture (PSA), and shows how to build on PSA with multipathing, failover, and ALUA. It thoroughly introduces Storage Virtualization Devices (SVDs) and VMDirectPath I/O, and shows how to drive powerful improvements in performance, flexibility, and manageability with VMFS 5 and VAAI. Mostafa Khalil, Senior Staff Engineer with VMware Global Support Services, specializes in storage integration for virtual environments. He has worked for VMware for 13 years and supported all VMware virtualization products since Workstation for Linux 1.0 beta. Khalil has worked on most enterprise storage vendors’ solutions and received engineering-level training for many of them. He has presented at every VMworld, and at VMware Partner Exchange, VMware User Group, and USENIX.